Puebla (Spanish pronunciation: [ˈpweβla] ( listen )), officially the Free and Sovereign State of Puebla (Spanish : Estado Libre y Soberano de Puebla) is one of the 31 states which, with the Federal District, comprise the 32 Federal Entities of Mexico. It is divided in 217 municipalities and its capital is the city of Puebla. Veracruz, formally Veracruz de Ignacio de la Llave, officially the Free and Sovereign State of Veracruz de Ignacio de la Llave, is one of the 31 states that, along with the Federal District, comprise the 32 federative entities of Mexico. It is divided in 212 municipalities and its capital city is Xalapa-Enríquez. Hidalgo, officially the Free and Sovereign State of Hidalgo, is one of the 31 states which, with Mexico City, comprise the 32 Federal Entities of Mexico. It is divided in 84 municipalities and its capital city is Pachuca de Soto. The Battle of Puebla took place on 5 May 1862, near Puebla City during the Second French intervention in Mexico. The battle ended in a victory for the Mexican Army over the occupying French soldiers. The French eventually overran the Mexicans in subsequent battles, but the Mexican victory at Puebla against a much better equipped and larger French army provided a significant morale boost to the Mexican army and also helped slow the French army's advance towards Mexico City. The Day of the Dead is a Mexican holiday celebrated throughout Mexico, in particular the Central and South regions, and by people of Mexican heritage elsewhere. The multi-day holiday focuses on gatherings of family and friends to pray for and remember friends and family members who have died, and help support their spiritual journey. In the Mexican culture death is viewed has a natural part of the human cycle. They view it has a day of celebration, they believe their loved ones awake and celebrate with them. They don't view it as a day of sadness but as a day of celebration. In 2008, the tradition was inscribed in the Representative List of the Intangible Cultural Heritage of Humanity by UNESCO. Huaquechula is a town in Huaquechula Municipality located in state of Puebla in central Mexico. The settlement dates back at least as far as 1110 CE although its center has moved to twice to its current location. Since its founding, it has been an agricultural community, today raising crops such as peanuts, corn and sorghum, although there are some handcrafts as well. 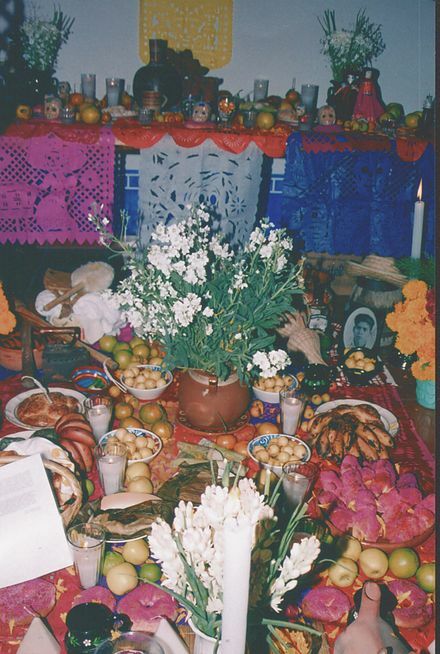 The town is known for its traditions related to the Feast of the Cross, but even more so for its “cabo del año” altars on Day of the Dead, which are dedicated to family members who have died during the previous year. These have been declared a cultural heritage of the state of Puebla and bring tourists to the town, mostly from Puebla. The Trans-Mexican Volcanic Belt, also known as the Transvolcanic Belt and locally as the Sierra Nevada, is a volcanic belt that covers central-southern Mexico. Several of its highest peaks have snow all year long, and during clear weather, they are visible to a large percentage of those who live on the many high plateaus from which these volcanoes rise. 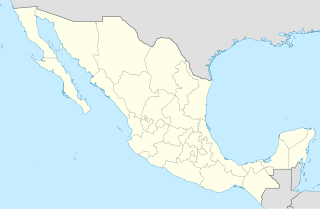 The Sierra Madre Oriental is a mountain range in northeastern Mexico. The Sierra Madre Oriental is part of the American Cordillera, a chain of mountain ranges (cordillera) that consists of an almost continuous sequence of mountain ranges that form the western "backbone" of North America, Central America, South America and Antarctica. 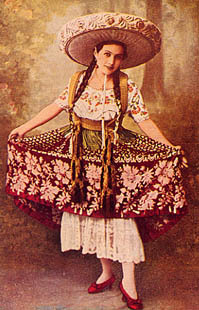 In 1921, Puebla had the second largest population, after Oaxaca, of purely indigenous people according to the national census. Since then, the official census has eliminated categories for race, counting only those who speak an indigenous language. In 2000, an attempt was made to count indigenous ethnicities, regardless of language spoken. This count ranked Puebla as fifth with a total population of 957,650. However, according to the 2005 census, there were 548,723 people who spoke an indigenous language. According to a 2000 census, Censo General de Población y Vivienda, Puebla has the highest number of Nahuatl speakers over 5 years of age. There are 416,968 speakers making up about 8.21% of the population of the state. Other foods common to the state include atole with chili pepper (chileatole), spicy mole verde, barbacoa, chilate with chopped onion, cemitas, cecina, guacamole with lime, and mole de caderas or mole espinazo. Many of these are found in the Sierra Mixteca region. However, the state is best known for cemitas, mole poblano, chiles en nogada and chalupas. Xalapa is the capital city of the Mexican state of Veracruz and the name of the surrounding municipality. In the 2005 census the city reported a population of 387,879 and the municipality of which it serves as municipal seat reported a population of 413,136. The municipality has an area of 118.45 km². Xalapa lies near the geographic center of the state and is the second-largest city in the state after the city of Veracruz to the southeast. Puebla, formally Heroica Puebla de Zaragoza and also known as Puebla de los Ángeles, is the seat of Puebla Municipality, the capital and largest city of the state of Puebla, and one of the five most important Spanish colonial cities in Mexico. A colonial era-planned city, it is located in (southern) Central Mexico on the main route between the capital, Mexico City, and Mexico's main Atlantic port, Veracruz—about 100km east southeast of Mexico City and about 220 km west of Veracruz. Guanajuato, officially the Free and Sovereign State of Guanajuato, is one of the 31 states which, with Mexico City, are the 32 federal entities of Mexico. It is divided into 46 municipalities and its capital city is Guanajuato. The largest city in the state is León. Atlixco is a city and a municipality in the Mexican state of Puebla. It is a regional industrial and commercial center but economically it is much better known for its production of ornamental plants and cut flowers. The city was founded early in the colonial period, originally under the jurisdiction of Huejotzingo, but eventually separated to become an independent municipality. The municipality has a number of notable cultural events, the most important of which is the El Huey Atlixcayotl, a modern adaptation of an old indigenous celebration. This event brings anywhere from 800 to 1,500 participants from all over the state of Puebla to create music, dance, and other cultural and artistic performances. The Nahuan or Aztecan languages are those languages of the Uto-Aztecan language family that have undergone a sound change, known as Whorf's law, that changed an original *t to before *a. Subsequently, some Nahuan languages have changed this to or back to, but it can still be seen that the language went through a stage. The best known Nahuan language is Nahuatl. Totonacapan refers to the historical extension where the Totonac people of Mexico dominated, as well as to a region in the modern states of Veracruz and Puebla. The historical territory was much larger than the currently named region, extending from the Cazones River in the north to the Papaloapan River in the south and then west from the Gulf of Mexico into what is now the Sierra Norte de Puebla region and into parts of Hidalgo. When the Spanish arrived, the Totonac ethnicity dominated this large region, although they themselves were dominated by the Aztec Empire. For this reason, they allied with Hernán Cortés against Tenochtitlán. However, over the colonial period, the Totonac population and territory shrank, especially after 1750 when mestizos began infiltrating Totonacapan, taking political and economic power. This continued into the 19th and 20th centuries, prompting the division of most of historical Totonacpan between the states of Puebla and Veracruz. Today, the term refers only to a region in the north of Veracruz were Totonac culture is still important. This region is home to the El Tajín and Cempoala archeological sites as well as Papantla, which is noted for its performance of the Danza de los Voladores. Cuetzalan (Spanish[kwetsa'lan] is a small town set high in the hills in the north of the Mexican state of Puebla, 183 kilometres from Puebla, the state capital. The Danza de los Voladores, or Palo Volador, is an ancient Mesoamerican ceremony/ritual still performed today, albeit in modified form, in isolated pockets in Mexico. It is believed to have originated with the Nahua, Huastec and Otomi peoples in central Mexico, and then spread throughout most of Mesoamerica. The ritual consists of dance and the climbing of a 30-meter pole from which four of the five participants then launch themselves tied with ropes to descend to the ground. The fifth remains on top of the pole, dancing and playing a flute and drum. According to one myth, the ritual was created to ask the gods to end a severe drought. Although the ritual did not originate with the Totonac people, today it is strongly associated with them, especially those in and around Papantla in the Mexican state of Veracruz. The ceremony was named an Intangible cultural heritage by UNESCO in order to help the ritual survive and thrive in the modern world. Huauchinango is a city in Huauchinango Municipality located in the far north of the state of Puebla in central Mexico. It is located in the rugged Sierra Norte de Puebla mountain region, filled with peaks, ravines and rivers that form waterfalls. The city is home to a locally venerated image called the Señor del Santo Entierro and also to the area's main commercial fair, the Feria de las Flores, which promotes the area's flower production, especially that of azaleas. The Benemérita Universidad Autónoma de Puebla (BUAP) is the oldest and largest university in Puebla, Mexico. Founded on 15 April 1578 as Colegio del Espíritu Santo, the school was sponsored by the Society of Jesus during most of the Spanish colonial era before turning into a public college in 1825 and eventually into a public university in 1937. The religious origins can be seen in many of BUAP's buildings in Puebla city centre, which were once colonial-era churches. The Sierra Norte de Puebla is a rugged mountainous region accounting for the northern third of the state of Puebla, Mexico. It is at the intersection of the Trans-Mexican Volcanic Belt and the Sierra Madre Oriental, between the Mexican Plateau and the Gulf of Mexico coast. From the Mesoamerican period to the 19th century, this area was part of a larger region called Totonacapan, and area dominated by the Totonac people, extending further east to the Gulf of Mexico. Political maneuvers to weaken the Totonacs led to the region being divided between the modern states of Puebla and Veracruz with the Puebla section given its current name. Until the 19th century, the area was almost exclusively indigenous, with the four main groups still found here today, Totonacs, Nahuas, Otomis and Tepehuas, but coffee cultivation brought in mestizos and some European immigrants who took over political and economic power. While highly marginalized socioeconomically, the area has been developed heavily since the mid 20th century, especially with the building of roadways linking it to the Mexico City area and the Gulf coast. Huaquechula Municipality is a municipality in Puebla in south-eastern Mexico. Pahuatlán, officially Pahuatlán del Valle, is a town and municipality located in the northwest of the state of Puebla in central Mexico. The municipality is part of the Sierra Norte region of the state, a steep mountainous area which receive significant moisture from the Gulf of Mexico, and borders the states of Hidalgo and Veracruz. Puebla Municipality is a municipality in the State of Puebla in eastern Central Mexico. The municipality covers a total area of 534.32 square kilometres (206.30 sq mi). The City of Puebla is the municipal seat, as well as the capital of the state. San Andrés Cholula Municipality is a municipality in Puebla in south-eastern Mexico. It forms part of the Metropolitan area of Puebla, and as of 2011, it is the fastest-growing municipality that conforms the Metropolitan Area, partly because the presence of universities and the wealthiest neighborhoods are located on San Andres Cholula. Along with San Pedro Cholula and Santa Isabel Cholula, it conforms the most ancient still inhabited city in the Americas, Cholula de Rivadabia. San Pedro Cholula is a municipality in the Mexican state of Puebla and one of two municipalities which made up the city of Cholula. The city has been divided into two sections since the pre Hispanic era, when revolting Toltec-Chichimecas pushed the formerly dominant Olmec-Xicallanca to the eastern side of the city in the 13th century. The new lords called themselves Cholutecas and built a new temple to Quetzalcoatl on the San Pedro side, which eventually eclipsed the formerly prominent Great Pyramid of Cholula, now on the San Andrés side. When the Spanish arrived in the 16th century, the city of Cholula was an important religious and economic center, but the center of power was on the San Pedro side, centered on what is now the main city plaza and the San Gabriel monastery. The division of the city persisted and San Pedro remained the more dominant, with Spanish families moving onto that side and the rest of the population quickly becoming mestizo. Today, San Pedro is still more commercial and less residential than neighboring San Andrés with most of its population employed in industry, commerce and services rather than agriculture. Although Cholula's main tourist attraction, the Pyramid, is in San Andrés, San Pedro has more tourism infrastructure such as hotels, restaurants and bars. 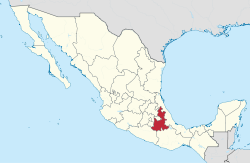 Zacatlán Municipality is a municipality in Puebla in south-eastern Mexico. The Universidad Popular Autónoma del Estado de Puebla (UPAEP) is a private (catholic), non-profit university located in Puebla, Mexico. ↑ "Senadores de la República por Entidad Federativa" (in Spanish). Retrieved 4 February 2017. ↑ "Resumen". Cuentame INEGI. Archived from the original on April 1, 2012. Retrieved February 12, 2013. ↑ "Relieve". Cuentame INEGI. Archived from the original on April 1, 2012. Retrieved April 5, 2011. 1 2 "Encuesta Intercensal 2015" (PDF). Retrieved December 8, 2015. ↑ "Jalisco". 2010. Archived from the original on April 20, 2011. Retrieved April 5, 2011. 1 2 3 4 5 6 7 8 9 10 11 12 "Medio Fisico" [Fisical Medium]. Enciclopedia de los Municipios de México Estado de Puebla (in Spanish). Mexico: Instituto Nacional para el Federalismo y el Desarrollo Municipal. 2009. Archived from the original on June 16, 2011. Retrieved October 10, 2010. ↑ "Desierto, bosque y selva (Puebla)" [Desert, forest and rainforest (Puebla)]. Mexico Desconocido (in Spanish). Mexico City. Retrieved October 10, 2010. 1 2 3 4 5 6 7 8 9 10 11 12 13 14 15 16 "Historia" [History]. Enciclopedia de los Municipios de México Estado de Puebla (in Spanish). Mexico: Instituto Nacional para el Federalismo y el Desarrollo Municipal. 2009. Archived from the original on June 16, 2011. Retrieved October 10, 2010. 1 2 3 4 5 6 7 Luis Alberto Martínez Álvarez (May 28, 2010). "Sucesos históricos de Puebla" [Historic events of Puebla] (in Spanish). Puebla, Mexico: Government of Puebla. Retrieved October 10, 2010. 1 2 3 4 Luz Cortés Padilla (May 21, 2009). "Angelópolis" [Angelopolis] (in Spanish). Puebla, Mexico: Government of Puebla. Retrieved October 10, 2010. ↑ Clara Ramirez (March 3, 1998). "Declaran en Puebla estado de emergencia" [Puebla declared a state of emergency]. Reforma (in Spanish). Mexico City. p. 13. ↑ Julia Preston (June 17, 1999). "Mexicans See a Call to Prayer In Quake Damage to Churches". New York Times. New York. p. A14. ↑ Mary Beth Sheridan (June 16, 1999). "6.7 Temblor in Mexico Kills 12" [Puebla declared a state of emergency]. Reforma (in Spanish). Mexico City. p. 13. ↑ "Mexican government urged to stop press freedom violations by local politicians". BBC Monitoring Americas. London. July 15, 2007. p. 1. ↑ "Numero de Habitantes" (in Spanish). INEGI. Retrieved October 10, 2010. 1 2 3 4 5 "Perfil Sociodemografico" [Socio demographic profile]. Enciclopedia de los Municipios de México Estado de Puebla (in Spanish). Mexico: Instituto Nacional para el Federalismo y el Desarrollo Municipal. 2009. Archived from the original on June 16, 2011. Retrieved October 10, 2010. ↑ John P. Schmal. "Indigenous Identity in the Mexican Census". Houston: The Hispanic Experience Houston Institute for Culture. Retrieved October 10, 2010. ↑ "Mixtecos" (in Spanish). Veracruz,: Universidad Veracruzana. Archived from the original on July 17, 2011. Retrieved October 10, 2010. ↑ "Arte de la Mixteca-Puebla". Historia del Arte (in Spanish). Veracruz. 2007–2010. Retrieved October 10, 2010. ↑ "La cultura mixteca" (in Spanish). Mexico: Arqueología Mexicana magazine/ Editorial Raíces S.A. de C.V. 1993. Archived from the original on September 29, 2010. Retrieved October 10, 2010. 1 2 3 Cecilia Gonzalez (February 7, 2001). "Aumenta migracion de grupos etnicos" [Migration of ethnic groups increases]. Reforma (in Spanish). Mexico City. ↑ "Regionalización" [Regions]. Enciclopedia de los Municipios de México Estado de Puebla (in Spanish). Mexico: Instituto Nacional para el Federalismo y el Desarrollo Municipal. 2009. Archived from the original on June 16, 2011. Retrieved October 10, 2010. 1 2 "Standard & Poor's revisa perspectiva del estado de Puebla a positiva de estable y confirma calificación de 'mxA+'" (in Spanish). Standard and Poors. Retrieved October 10, 2010. ↑ Francisco Rivas (March 1, 2006). "Teme IP de Puebla crisis y polarizacion" [IP fears crisis and polarization in Puebla]. El Norte (in Spanish). Monterrey, Mexico. 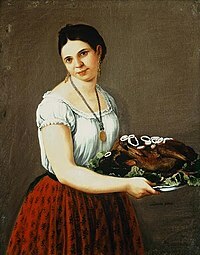 1 2 3 4 5 6 7 Daniela Clavijo López (November 3, 2005). "Puebla, un estado prometedor" [Puebla, a promising state]. El Economista (in Spanish). Mexico City. 1 2 3 4 Jorge Machuca (November 16, 2008). "Puebla, séptimo estado subdesarrollado: ONU" [Puebla, seventh most underdeveloped state according to the UN]. Milenio (in Spanish). Mexico. Archived from the original on July 24, 2011. Retrieved October 10, 2010. 1 2 "Historia de la UPAEP" (in Spanish). Puebla: Universidad Popular Autónoma del Estado de Puebla. Retrieved October 10, 2010. 1 2 3 4 5 6 7 8 9 10 "Actividad Economica" [Economic activity profile]. Enciclopedia de los Municipios de México Estado de Puebla (in Spanish). Mexico: Instituto Nacional para el Federalismo y el Desarrollo Municipal. 2009. Archived from the original on June 16, 2011. Retrieved October 10, 2010. 1 2 Eligio Esquivez Gonzalez (May 12, 2006). "Opinion – Agronegocios. Limitada, la inversion en Puebla; [Source: El Economista]" [Opinion- Agribusiness. Investment in Puebla limited]. Noticias Financieras (in Spanish). Miami. p. 1. 1 2 Eduardo Carrera (May 25, 2010). "Sector Textil" [Textile Sector] (in Spanish). Puebla, Mexico: Government of Puebla. Retrieved October 10, 2010. ↑ Eduardo Carrera (May 25, 2010). "Sector Automotriz" [Automobile Sector] (in Spanish). Puebla, Mexico: Government of Puebla. Retrieved October 10, 2010. ↑ Eduardo Carrera (May 25, 2010). "Sector Agroindustrial" [Agro-industrial Sector] (in Spanish). Puebla, Mexico: Government of Puebla. Retrieved October 10, 2010. 1 2 3 4 5 Luis Alberto Martínez Álvarez (May 28, 2010). "Artesanias" [Handcrafts] (in Spanish). Puebla, Mexico: Government of Puebla. Retrieved October 10, 2010. ↑ "Anuncian apertura de Outlet Puebla" [Announce opening of Outlet Puebla]. Reforma (in Spanish). Mexico City. April 1, 2001. ↑ Ignacio Álvarez Hernández (September 8, 2010). "Pide "mano" Puebla como aeropuerto alterno al DF" [Pueblas asks for "hand" to become the alternative airport to Mexico City]. Uno mas Uno (in Spanish). Mexico. Retrieved October 10, 2010. 1 2 "Rutas Turísticas" [Tourist Routes] (in Spanish). Puebla, Mexico: Government of Puebla. Retrieved October 10, 2010. 1 2 3 Luz Cortés Padilla (April 27, 2009). "Ruta Turística – Sierra Mixteca" [Tourist Route – Sierra Mixteca] (in Spanish). Puebla, Mexico: Government of Puebla. Retrieved October 10, 2010. ↑ Luz Cortés Padilla (April 27, 2009). "Ruta Turística – Sierra Mágica" [Tourist Route – Sierra Magica] (in Spanish). Puebla, Mexico: Government of Puebla. Retrieved October 10, 2010. ↑ Luz Cortés Padilla (August 25, 2009). "Filmaciones Haciendas" [Hacienda filmings] (in Spanish). Puebla, Mexico: Government of Puebla. Retrieved October 10, 2010. ↑ Luz Cortés Padilla (September 15, 2009). "Proyectos Filmados en Puebla" [Films shot in Puebla] (in Spanish). Puebla, Mexico: Government of Puebla. Retrieved October 10, 2010. ↑ Humberto Nino de Haro (June 8, 2009). "Estados de Puebla y Veracruz inician campanas para reactivar turismo" [States of Puebla and Veracruz begin campaigns to reactivate tourism]. Noticias Financieras (in Spanish). Miami. ↑ Luis Alberto Martínez Álvarez (January 8, 2007). "Cantona" [Cantona] (in Spanish). Puebla, Mexico: Government of Puebla. Retrieved October 10, 2010. ↑ Luis Alberto Martínez Álvarez (May 28, 2010). "Cholula" [Cholula] (in Spanish). Puebla, Mexico: Government of Puebla. Retrieved October 10, 2010. ↑ Luis Alberto Martínez Álvarez (May 28, 2010). "Tepexi el Viejo" [Tepexi el Viejo] (in Spanish). Puebla, Mexico: Government of Puebla. Retrieved October 10, 2010. ↑ Luis Alberto Martínez Álvarez (May 28, 2010). "Yohualichan" [Yohualichan] (in Spanish). Puebla, Mexico: Government of Puebla. Retrieved October 10, 2010. ↑ Luis Alberto Martínez Álvarez (May 28, 2010). "Tepatlaxco" [Tepatlaxco] (in Spanish). Puebla, Mexico: Government of Puebla. Retrieved October 10, 2010. 1 2 Luis Alberto Martínez Álvarez (May 28, 2010). "Cemitas Poblanas" [Cemitas of Puebla] (in Spanish). Puebla, Mexico: Government of Puebla. Retrieved October 10, 2010. 1 2 3 4 "Mole Poblano: Mexico's National Food Dish". Mexonline. Retrieved 2009-10-21. 1 2 Quintero M., Josefina (2007-09-23). "92% de la población se dedica a la preparación y venta del mole" (in Spanish). Mexico City: La Jornada. Retrieved May 30, 2009. ↑ Luis Alberto Martínez Álvarez (May 28, 2010). "Chiles en Nogada" [Chiles en Nogada] (in Spanish). Puebla, Mexico: Government of Puebla. Retrieved October 10, 2010. ↑ Luis Alberto Martínez Álvarez (May 28, 2010). "Chalupas" [Chalupas] (in Spanish). Puebla, Mexico: Government of Puebla. Retrieved October 10, 2010. ↑ Luis Alberto Martínez Álvarez (May 28, 2010). "Leyendas" [Legends] (in Spanish). Puebla, Mexico: Government of Puebla. Retrieved October 10, 2010. ↑ Luis Alberto Martínez Álvarez (May 28, 2010). "Casa del que mato al Animal" [House of He who killed the animal] (in Spanish). Puebla, Mexico: Government of Puebla. Retrieved October 10, 2010. 1 2 "Fiestas y tradiciones Álvarez" [Festivals and traditions] (in Spanish). Puebla, Mexico: Government of Puebla. Retrieved October 10, 2010. 1 2 John P. Schmal. "El cinco de mayo: una lucha por la libertad" (in Spanish). Houston: The Hispanic Experience Houston Institute for Culture. Retrieved October 10, 2010. ↑ "Cinco de Mayo: History, Facts & Meaning - HISTORY". HISTORY.com. ↑ "What Is Cinco de Mayo?". ↑ Luz Cortés Padilla (July 27, 2009). 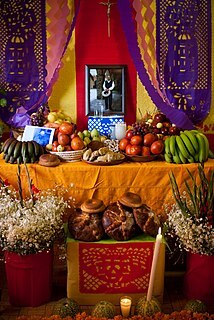 "Día de muertos y altares de Huaquechula" [Day of the Dead and altars of Huaquechula] (in Spanish). Puebla, Mexico: Government of Puebla. Retrieved October 10, 2010. 1 2 Luz Cortés Padilla (May 22, 2009). "Carnaval de Huejotzingo" [Carnival of Huejotzingo] (in Spanish). Puebla, Mexico: Government of Puebla. Retrieved October 10, 2010. ↑ Luz Cortés Padilla (July 22, 2009). "Equinoccio en Cantona" [Equinox in Cantona] (in Spanish). Puebla, Mexico: Government of Puebla. Retrieved October 10, 2010. ↑ Luz Cortés Padilla (July 22, 2009). "Ritual Quetzalcóatl" [Quetzalcoatl Ritual] (in Spanish). Puebla, Mexico: Government of Puebla. Retrieved October 10, 2010. ↑ Luz Cortés Padilla (July 27, 2009). "Festival Huey Atlixcáyotl" [Huey Atlixcáyotl Festival] (in Spanish). Puebla, Mexico: Government of Puebla. Retrieved October 10, 2010. ↑ Luz Cortés Padilla (July 22, 2009). "Fiesta del Santo Entierro y Feria de las Flores Huauchinango" [Feast of the Holy Burial and Flower Fair of Huauchinango] (in Spanish). Puebla, Mexico: Government of Puebla. Retrieved October 10, 2010. ↑ Luz Cortés Padilla (July 27, 2009). "Feria Nacional del Café y el Huipil en Cuetzalan" [National Coffee and Huipil Far in Cuetzlan] (in Spanish). Puebla, Mexico: Government of Puebla. Retrieved October 10, 2010. ↑ "Historia y leyenda de la china poblana De la Colonia" [History and legend of the "China Poblana" of the colonial period]. Red Escolar (in Spanish). Mexico: Instituto Latinoamericano de la Comunicacion Educativa. Retrieved October 10, 2010. ↑ "The Folk Baroque churches of southern Morelos and Puebla". Exploring Colonial Mexico. Espadaña Press. Archived from the original on September 30, 2010. Retrieved October 10, 2010. 1 2 Ricardo Diazmunoz; Maryell Ortiz de Zarate (April 24, 2005). "Encuentros con Mexico / El arte fluye en las calles; " [Encounters with Mexico/Art flows in the streets]. Reforma (in Spanish). Mexico City. ↑ Campbell, Monica (December 14, 2007). "Dissension Racks Elite Mexican University". The Chronicle of Higher Education. Washington. 54 (16): A1. ↑ "Educacion" (in Spanish). 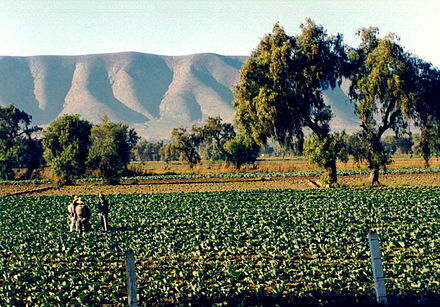 Mexico: INEGI. Retrieved October 10, 2010. 1 2 "Gobierno" [Government]. Enciclopedia de los Municipios de México Estado de Puebla (in Spanish). Mexico: Instituto Nacional para el Federalismo y el Desarrollo Municipal. 2009. Archived from the original on June 16, 2011. Retrieved October 10, 2010. Jimenez Gonzalez, Victor Manuel, ed. (2010). Puebla:Guía para descubrir los encantos del estado[Puebla: Guide to discover the charms of the state] (in Spanish). Barcelona: Editorial Oceano, S. L. ISBN 978-607-400-234-8. Wikimedia Commons has media related to Puebla .